Technology services and devices come and go. When it comes to computer storage, floppy disks and Zip Drives are considered ancient history. Even DVDs are practically becoming antiques. The latest computer storage technology is cloud-based services — meaning your files, data and programs are accessible on your computers and devices, but are hosted on secure, redundant servers at an offsite location. Unlike many storage options in the past, the cloud has staying power for one simple reason: Combined with a fast Internet connection, the cloud is accessible anywhere in the world. Just like logging on to an email account, the information stored in the cloud is always available. 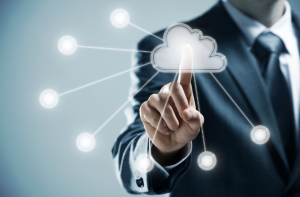 The cloud allows users to access the fastest and most up-to-date hardware and software, without the cost of buying, updating and maintaining equipment. It also lets you share software with multiple people and stay current with the latest updates. Some of today’s top providers of cloud-based services are Dropbox, Amazon Cloud, Google Drive, Microsoft OneDrive, Box and Apple iCloud. Additionally, for many small businesses, file sharing is key. Cloud-based services allow users to share in project tracking, accounting and document management — saving users both time and money. And when a document is updated in the cloud, the changes made are reflected on each user’s account. No more keeping track of versions sent back and forth over email — the cloud makes sharing seamless with the most efficient options available. In 2013, a survey conducted by the National Small Business Association showed that 57 percent of small businesses are using some form of cloud computing — compared to only 5 percent in 2010. By 2020, industry experts predict that more than 80 percent of small businesses will be using the cloud, according to a joint survey conducted by Emergent Research and the financial software company Intuit. But the benefits of the cloud aren’t limited to small businesses. When a disaster strikes, no one wants to be left without their most important photos, documents and music. Rather than trying to spend weeks recovering lost data, the cloud provides a virtual environment to keep data up and running. In order to make the most of cloud-based technologies, a high-speed Internet connection is crucial. For a small business or personal user of cloud services, broadband Internet speeds are essential in order to share large files, as well as run hardware and software services effectively. Cloud-based files work easily with Mac- and Windows-based computers. Whether you’re on a smartphone, tablet, laptop or desktop computer — files, software programs and hardware systems are accessible with the cloud. The cloud provides the peace of mind necessary to know that your important data is always safe, secure and accessible from anywhere in the world.